Republication on the twenty-fifth anniversary of "e;Pretends to Be Free"e; recognizes the signal importance of its sterling presentation of northern self-emancipation. Today, even more than a quarter-century ago, these fugitive slave notices are the best verbal snapshots of enslaved Americans before and during the American Revolution. 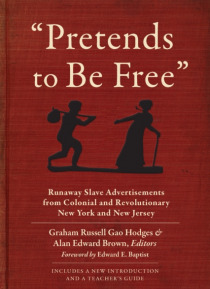 Through these notices, readers can discover how enslave… d blacks chose allegiance during our War for Independence.Replete with a preface by Edward E. Baptist, the leading scholar of slavery and capitalism and director of a massive project aimed at digitalizing every escape notice, and with a new Introduction and teacher's guide by Graham Hodges, this new edition makes this documentary study more relevant than ever.